After doing my Bare Study vs. 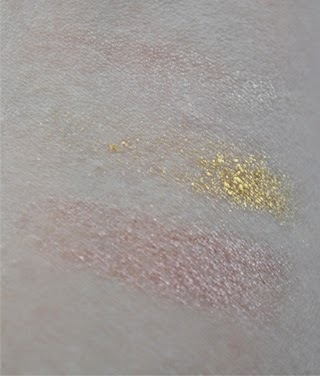 Barely Branded post I decided it would be good to review the rest of the metallic range (at least those that I own) which are Inked in Pink and Gold rush, I also included Barely Branded for comparison. You can get the colour tattoos for $5.00-6.50 CAD in most drug stores. 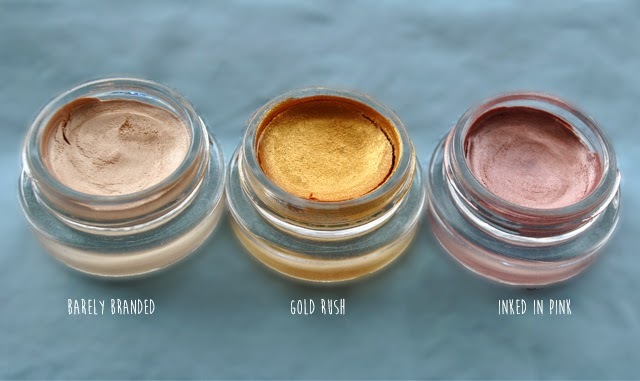 You can see in the above picture a crack has formed in Gold Rush meaning it's starting to dry out, so if you do buy any of the colour tattoos make sure you close the lids tightly! 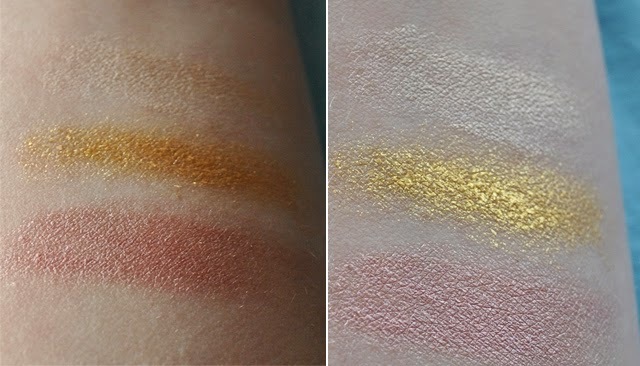 Here are the swatches in both shadow and window light. Both Inked in Pink and Gold Rush apply more smoothly than barely branded. 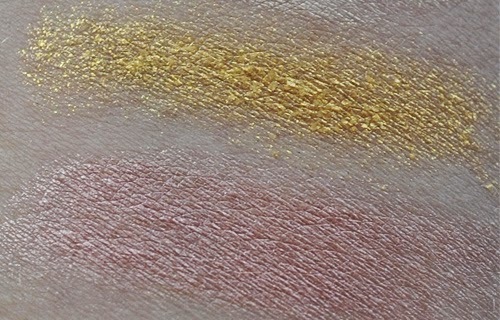 The only thing I don't like about about Gold rush is it can be a bit flaky (not super flakey but more than Inked in Pink) and rather than just being shimmery with a bit of glitter (like Inked in Pink) there are a lot of individual sparkles (if you compare the left ends of the above swatches and you can see a lot more glitter in Gold Rush) that got all over the place when I was applying it even though its a cream shadow and I didn't think that could happen. As for longevity wear on the eyelid was pretty similar between Inked in Pink and Gold Rush, though ultimately I think Inked in Pink stayed a bit better, however they both stayed far better than Barely Branded. In the left picture there is Barely Branded on top, followed by Gold Rush, and then Inked in Pink. I wiped across them with a kleenex (from left to right) to try and get them off my arm and what you see here is the result. Barely Branded is almost completely gone, some of Gold Rush remained, and almost all of Inked in Pink is still there. Overall if you were going to buy one go for Inked in Pink. Its good on its own, has the nicest application and longevity. It also works well as a base for the Naked 3 palette. We don't even have half of the shades available in the US, in the UK! 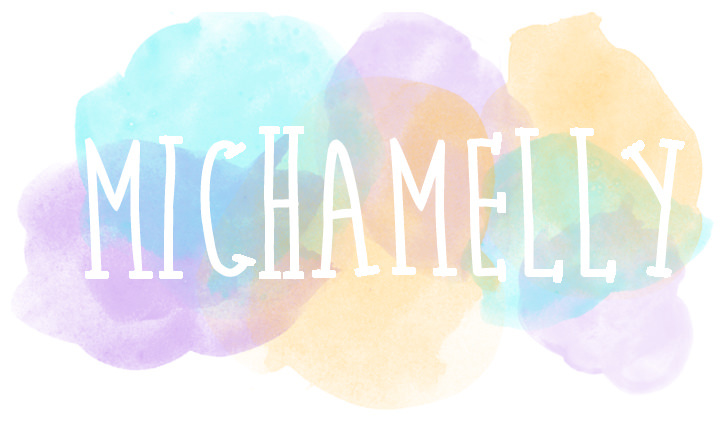 Barely Branded looks so cuute!